The Rhodes Run, South Africa's iconic breathtaking trail run, is staged in the tranquil beauty of the southern Drakensberg mountains surrounding the Victorian-era village of Rhodes. The idea of the race came during a discussion between Rhodes property owners over a couple of drinks one night in 1986. The intention was to put Rhodes back on the map before it followed the same fate as other small platteland villages which faded into obscurity. This vision led to the birth of a unique event on the South African sports calendar. The first event was staged in July 1989, and almost did not happen thanks to very heavy snow falls the night before. The start of the 2001 event was delayed while officials checked conditions to establish if seconding vehicles would be able to safely reach the runners after snow fell early on race morning. 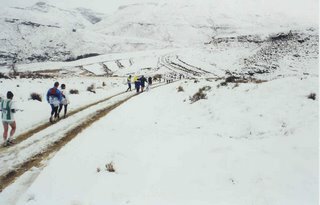 In 2002 exceptionally heavy snowfalls in the week leading up to the race forced a route change as the feeding station helpers were not able to reach the plateau and runners could not make their way through the deep snow in the Kloppershoek/Mavis Bank kloof. 2009, the 21st birthday edition, again saw heavy snow cause route changes. Vehicles were not able to move along the Lesotho border road due to very deep snow drifts and the 'top' check point was moved to the Carlislehoek/Lesotho border road T-junction. The 'King' and 'Queen' of the Kloof positions were adjudged at Lesotho View. The deep snow also meant that runners were diverted off the Hooggenoeg Ridge section in 2009. 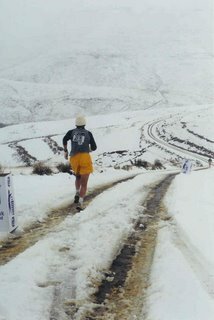 In 2012 runners ran through falling snow, and due to conditions 'up top' the route was again diverted with Mavis Bank and Hooggenoeg Ridge not forming part of the challenge. The atmosphere before and after the race is extremely festive. 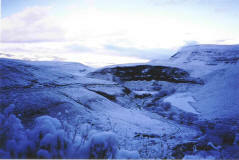 It is common for the temperature at the start to be below zero (usually around -10 degrees Celsius!). The race has a limited field of about 300 runners. Entry is by invitation only with an effective substitution facility. Should you wish to receive an invitation you need to fill out and submit a waiting list form and will then be placed on the waiting list. In the true spirit of trail running there are no financial prizes - and other than a few floating trophy's all our runners are treated equally with the same pre and post race hand-outs, which in themselves are usually rather special.